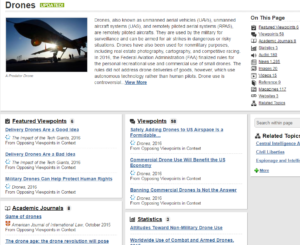 Pictured: Information about “Drones” in Opposing Viewpoints in Context. Content includes viewpoints, academic journals and statistics. Current events are rarely simple or clear cut. Fortunately, Opposing Viewpoints in Context connects researchers with the context of the different perspectives behind current issues, along with reliable facts and evidence. 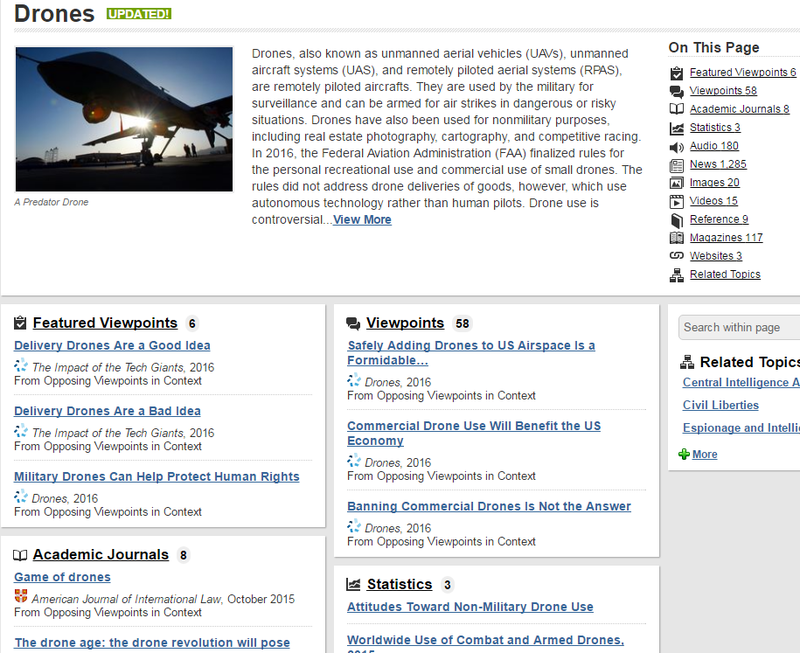 Opposing Viewpoints in Context is a database that contains detailed, reliable information about current events. This information comes from a variety of sources: newspapers, magazines, reference works, and scholarly journals. Additionally, several different perspectives for each current issue give more context. Researchers can use all of this information to understand the full context behind today’s headlines. Newspaper articles and essays about current events, called viewpoints, provide up-to-date information about current events. However, bias in news articles and viewpoints means researchers need more information to get the big picture. In addition to Opposing Viewpoints in Context, PSU Library has other resources available to help researchers understand current events. CQ Researcher has in-depth coverage of current social and public policy issues. Professional journalists write and fact-check these reports. These articles include an overview, history, chronology, pro/con feature, plus additional resources for further research. CQ Researcher is an excellent database to use in addition to Opposing Viewpoints in Context. The Identify & Challenge Fake News guide was made by PSU Librarians to help researchers identify, verify, and understand the news. It provides background information about what “fake news” is, as well as current examples of fake news. There is also information about fact-checking and finding accurate information. Researchers can also learn about how media consumption like search algorithms, as well as political news, affects personal biases. Finally, resources for instructors are available to facilitate discussion and help students evaluate information. Please note that off-campus access to Opposing Viewpoints in Context and CQ Researcher is restricted to current PSU students, faculty, and staff.